Introducing the first on cart BBQ grill designed for individuals with disabilities, this ADA compliant grill is accessible, yet practical and has all the amazing features of the Sedona by Lynx Grill. The cooking surface measures 32-inches high and the bullnose is insulated to reduce temperatures at the front of the grill. This 30-inch grill has one ProSear burner and one stainless steel burner for a total of 46,000 BTUs. 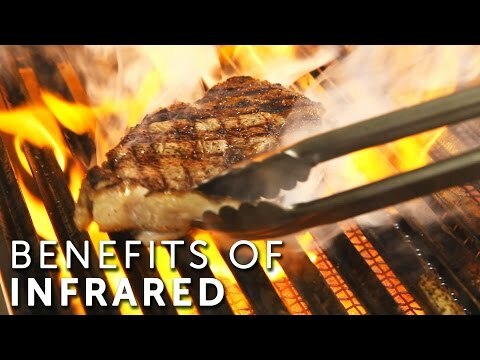 The ProSear burner sears meat to perfection for mouth-watering steak. Easily light the grill using the time tested spark ignition system with a battery backup for a reliable start every time. Over the burners, an array of fixed position ceramic briquettes ensures precise, even heat distribution to the 508 square-inch main cooking grid while a secondary grid provides an additional 225 square-inches for a comprehensive 733 square-inches of overall grilling space. The grill also has an internal rotisserie with heavy-duty motor and 12,500 BTU rear infrared burner to raise your cooking options to their full potential. The Lynx L500ADAR-NG natural gas grill on cart is made of 201 stainless steel using welded construction to eliminate gaps where grease and moisture can collect. The adjustable side handle and hood assist kit help you make lifting the hood nearly effortless. Like to grill into the night? 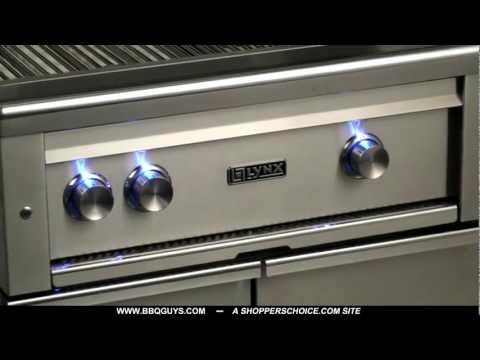 The adjustment knobs on the control panel sport blue LED accent lights for precise control and an ultra-bright internal halogen light illuminates the grilling surface eliminating guess-work. The stainless steel cart includes a grill storage system with two easy slide drawers for storing grilling tools and accessories.